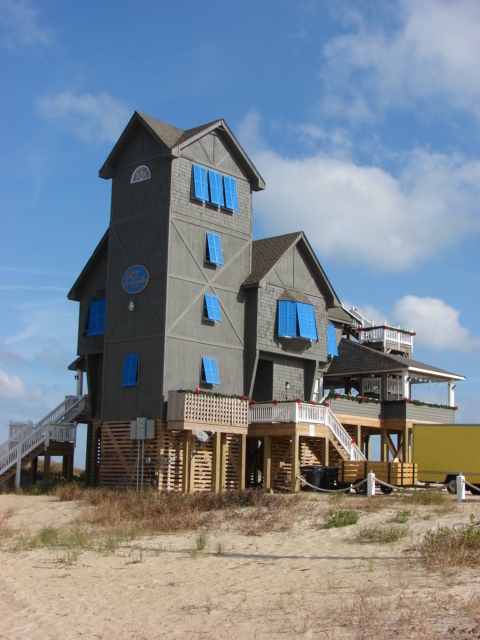 I’ve included a photo I took while there finding the geocache, Nights In Rodanthe. After taking the dogs out on the beach in the morning, we all piled into the car to head south to geocache our way down to Cape Hatteras and its light house. Here is a bit of info about the light house and the area in general. 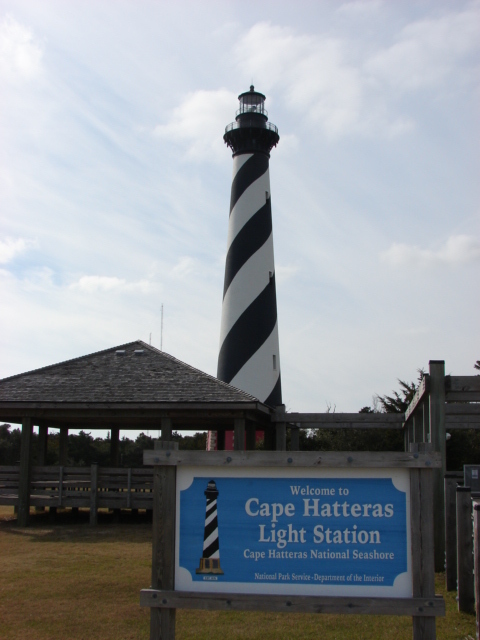 Cape Hatteras Lighthouse is the tallest in the nation and a famous symbol of North Carolina. 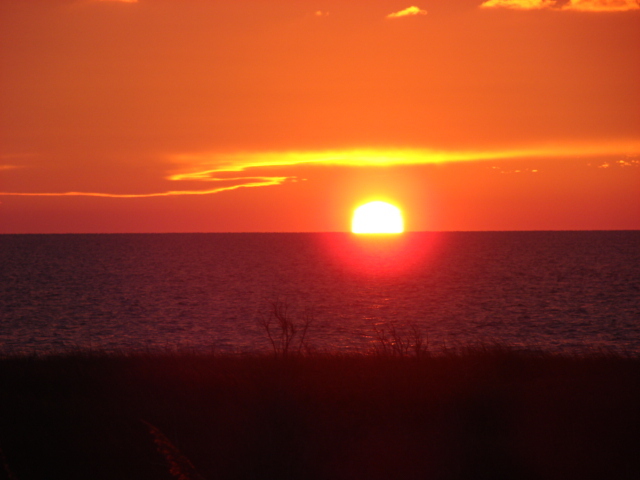 The beacon from the light can be seen some 20-miles out to sea and has warned sailors for more than 100 years of the treacherous Diamond Shoals, the shallow sandbars which extend some 14 miles out into the ocean off Cape Hatteras. Upon our return to Camp Hatteras RV Resort and Campground I noticed that a couple of folks had arrived and set up camp for a long weekend. I think there are 5 of us now in a campground that has 412 closely situated sites. http://www.camphatteras.com/. I can’t imagine staying here during the summer with all the sites filled. Anyway, today I had the indoor pool and hot tub all to myself before heading across the road to the Sound and sunset. Today, its cloudy and breezy should get into the 50’s with more sun coming. I think I’ll head up to Kitty Hawk/Kill Devil Hills to check out the spot where Orville and Wilbur Wright made history with the first flying machine. Either that, or I’ll stay home and start on the baby quilt I’m going to make for Suefly’s baby, Edgar who is due to make his first appearance in the world in mid February. I am so jealous! My ideal life would be snuggled in there, ocean front for “the duration.” IDEA…I often see traveling billboards in Knoxville. What about getting a company like COKE, PEPSI, BANK OF AMERICA…..some nationally known name who would like to make Dora into a traveling advertisement? You could get a monthly contract and send pictures back to them from your travels. They could even do a feature with you so the entire nation could follow along. Great pictures at the beach. Victoria visited the Caped Hattaras lighthouse while visiting Jeremy at his basic training graduation in 2001. Have you seen the pictures chosen for the 2011 Geocache Alaska calendar? You might recognize one as you were there when it was taken. Great job, Margie. Keep ’em coming. I’m traveling thru you right now. love this post–I was a sucker for Richard Gere in that film too–so fun to see that beach house again–haven’t been back there since I saw the movie. 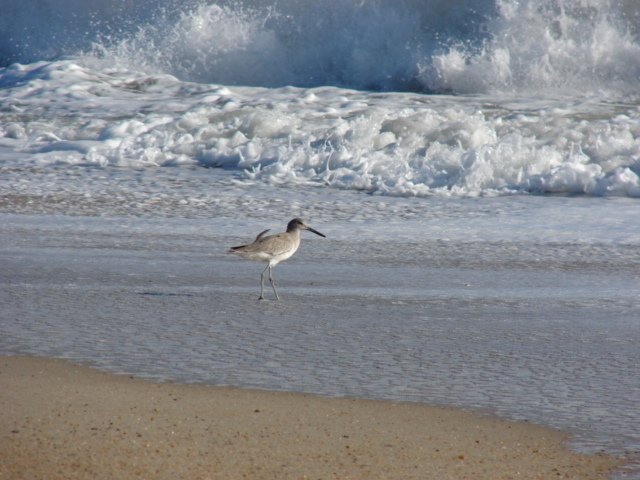 I grew up in this country–remind me to tell you about my camper experience at Cape Hatteras National Seashore–don’t think we actually camped in the campground as we were definitely too noisy for the likes of it–beautiful area with many fond memories–fun to see the beautiful waves and sunset again. As Devin said,”I’m traveling thru you right now” too. Lucinda, don’t know you but think your idea for Margie and Dora is super cool!